Descubra la rica historia y cultura local de Lucca a través de sus papilas gustativas en un recorrido gastronómico a pie de 2,5 horas. Siga su guía, y sus sentidos, a través del centro atmosférico de la ciudad dentro de los muros del Renacimiento, escuche historias del pasado de la ciudad mientras se detiene para probar delicias dulces y saladas. Pruebe el espresso y la tarta en una cafetería, los deliciosos dulces de chocolate en una confitería y los productos que se encuentran en un almuerzo típico de Luccan, como los quesos y las carnes curadas. Rematá todo con una copa de vino o cerveza regional. Comience la mañana en estilo italiano con café y pastelería. Sé parte de la larga historia de amor de Lucca con chocolate en una tienda de dulces. My husband and I wanted to do something different from the typical hop in a vehicle and drive all around type tours. We booked Flavours of Lucca and were not disappointed. It ended up being a personal tour with an amazing tour guide, Chiara. She walked us around Lucca, and was a wealth of information, as well as friendly, funny and personable. We stopped at many points along the way and had many delicious tastings. We did not need lunch after this tour! 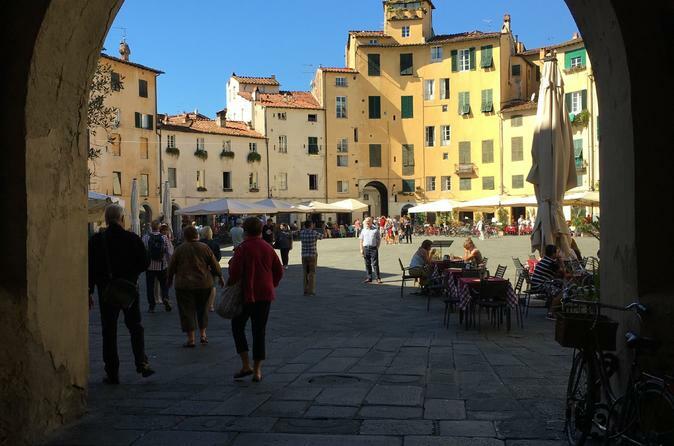 Lucca has an amazing history, so it is fantastic for people who are interested in historical experiences without the crushing crowds. Lucca also has delicious food, so it's interesting for foodies! Was an incredible tour with Borana. My family originally is from this small town, so it was great having a guide bring it to life and show us around. Would highly recommend, especially that desert we have with the pistachio cream! We thoroughly enjoyed our walking tour with Lucca Russo. He was an excellent guide and told us many things about Lucca and Tuscany - and even discussed the olive trees and grape vines grown in the region. We sampled many types of food and sweets and ended with a nice lunch of antipasti and breads and wine. Lucca even took photos of our group and sent them to us after the fact. I would rate this tour the best of any we took in Italy! Really good tour of an amazing place - lots of great food. Guide was really nice. 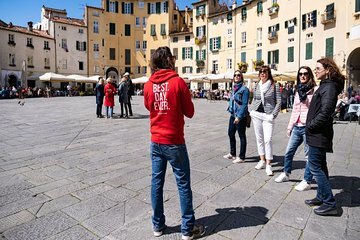 Our tour guide, Chiara, met us as instructed, spoke excellent English, and guided us through Lucca with appropriate and interesting commentary on the history, culture, architecture, and food of Lucca. She offered tips on other tourist opportunities as well as suggestions for good places to eat, including gluten free options where needed. Her personable approach made the tour a lot of fun for us. Well organised and entertaining. We enjoyed a coffee and morning tea as well as a light lunch cold meats. We covered a lot of ground. Well worth it. Our guide, Chiara, was excellent, and gave us an enthusiastic introduction to Lucca. The very best bit was the stop where we had 'Cecina', a sort of flat bread made from chickpea flour, water and salt - nothing else. Before we left Lucca a couple of days later we returned for more, it had been so nice. We also bought chickpea flour from a grcoery store and made our own Cecina as soon as we got home, with great success! Lucca is a beautiful city, and Chiara brought it to life for us. We'd thoroughly recommend this tour! This tour was exceptional. Our guide, Diletta, was friendly, knowledgeable and charming exhibiting a true appreciation of Lucca and its history, food and store fronts. This was a group tour of 10 the absolute perfect size which allowed interaction between each member of the group and the guide. We visited charming, top-drawer local establishments as part of the tour and the business representatives were most gracious and welcoming. I would do this again in a heartbeat. This was a great tour! Our guide, Borana Meta, was so generous with her time and knowledge. The food stops were fun but Borana's discussions of points of interest big and small, famous and not so famous truly made this an enriching and unique experience. My wife and recently toured Lucca with our guide Diletta Barbieri from Urban Adventures Italy. I cannot speak highly enough of Diletta. A highly capable and professional guide. She was from Lucca and was able to speak knowledgeably with clear insight regarding culture and history of the city. We walked to many churches in Lucca and places of heritage and historical interest. She encouraged us to ask questions and we received a great amount of information which we could absorb.She achieved a fine balance by her relaxed presentation and engaging personality. If we return to Lucca for more tours we would not hesitate to ask for Diletta.